Ken Armstrong Writing Stuff: Perhaps Focus is the Thing? 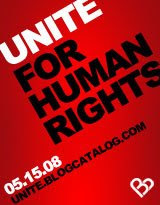 Today is a day when Bloggers Unite for Human Rights. Look around, lots of Bloggers are doing it. It’s dead good. As for me… I don’t have an awful lot that I can tell you about Human Rights. I fit more easily into the group of people who need to ‘be told’ rather than those who should try to tell. What I do know is that I seem to lead an amazingly insular life. Earthquakes, Wars, Droughts, Famine, they all can make me feel sad and nervous, sympathetic and outraged by turns… but never for terribly long. I am often amazed and a more than a bit disgusted at how fast I can get over things, how easily I can move on. I would really have to focus hard into these things to enable them to really pierce my hide. And, if I did that all of the time, how on earth could I remain standing up? I was at the ‘Live Aid’ concert in Wembley in 1985 – no, really, I was. Me and Robbie Gavin brought along a big picnic bag and we didn’t break it out until Elton John came on – I still remember all those envious eyes around us. Live Aid was a good show. More to the point though, it gave me a focus. Temporary, yes, but a focus nonetheless. For that day and for some time afterward, I was made aware that, for whatever reason, people were being denied the minimum conditions for human dignity and a tolerable life. I didn’t ‘solve’ it, I guess I didn’t even help terribly much. But at least I focused on it. I allowed it to pierce me and hurt me and then, I suppose, I moved on. I can’t focus on ‘Human Rights’. It’s too big a thing. But (for the day that’s in it) I’d like to focus on something and maybe feel a little hurt about it. Whatever it is, it’s probably due at least that from me. I’m going off now to my search-engine-of-choice. I’m going to try putting ‘Human Right’ and the name of my home place into it. I already know what’s going to come up. I would tell you what it is but I don’t know nearly enough about it to do the subject justice. Perhaps sometime soon, I will. That is an honest observation. At least you don't pretend to know everything. Your card is back. It was weird what happened earlier.